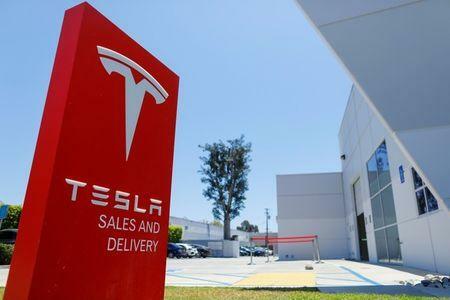 (Reuters) - Tesla Inc has delivered 200,000 electric cars to buyers in the United States, a spokesperson said on Thursday, meaning tax credits will now begin to be lowered, while rivals such as Mercedes-Benz, BMW AG and Audi AG will bring electric models to the market with a full tax credit in place. Under a major tax overhaul passed by the Republican-controlled U.S. Congress late last year, financial incentives in the way of tax credits that lower the cost of electric vehicles are available for the first 200,000 such vehicles sold by an automaker. The tax credit is then reduced by 50 percent every six months until it phases out. From Jan. 1 next year, the $7,500 tax credit will drop to $3,750 around mid-year, the Tesla website said. General Motors Co will also face the same problem as Tesla in the near future, as it is expected to hit the 200,000 mark with sales of its Chevrolet Bolt EV, the Chevrolet Spark all-electric subcompact car and Chevrolet Volt plug-in hybrid. The declining tax credit is seen as putting Tesla and GM at a disadvantage over newer entrants to the market, whose first 200,000 models will qualify for a full tax credit. GM sold an estimated 184,000 full electric or plug-in hybrid vehicles through June, according to website insideevs.com, which tracks electric vehicle sales. A spokesman for GM did not immediately respond to a request for comment. Earlier this year, amid concerns they could miss the federal tax break, some potential buyers of Tesla's long-delayed Model 3 sedan began seeking alternatives, including GM's Bolt, according to postings by would-be Tesla buyers on websites and interviews with GM dealers. Both GM and Tesla have been lobbying Congress since last year, hoping to win changes to tax law that would allow them to continue to collect the tax credit, but have been unsuccessful to date. In March, GM Chief Executive Mary Barra called on Congress to expand the consumer tax credit for electric vehicles as the company boosted production of the Bolt in response to strong demand. Last week, GM said demand for the Bolt in the United States, Canada and South Korea had "outstripped production" and that it would increase output in the fourth quarter by 20 percent.